Years ago, during college, I had the privilege of going to Peru for a week to help participate in some medical and humanitarian work. Tell you what: awesome experiences all week long. From getting schooled by seven year olds in soccer to teaching them English words like "poop" to having real, honest conversations with folks half a world and a culture apart from anything I had ever experienced before, it was fantastic. The food wasn't half bad, either. Fried plaintains every day for breakfast, lunch on the go (usually pb&j washed down with a Inca Kola*). and a homecooked dinner every night - usually chicken and rice with a variety of hot sauces to mix in - it was really good. Our last night before flying out of Lima, my gringo posse hit up a fancyish restaurant for one last Peruvian feast - oh man. I personally plowed thru a platter of anticuchos and rice, while most of my friends guzzled chicha morada, a bluish/purplish corn juice that I personally didn't care for. That worked out for me - as most of them discovered thousands of feet in the air on the way to Houston, it can have a decidedly laxative effect for the uninitiated. That's been my one real experience with Peruvian cuisine. There's a pretty decent place in Pittsburgh's Strip District called Chicken Latino, where I can still fulfill my occasional anticuchos and Inca Kola hankerin'. Also, as a side, they have these ginomontrosities of corn kernels, which kinda taste more or less like normal white corn, just a lot bigger, like I suddenly grew a set of baby hands or something. 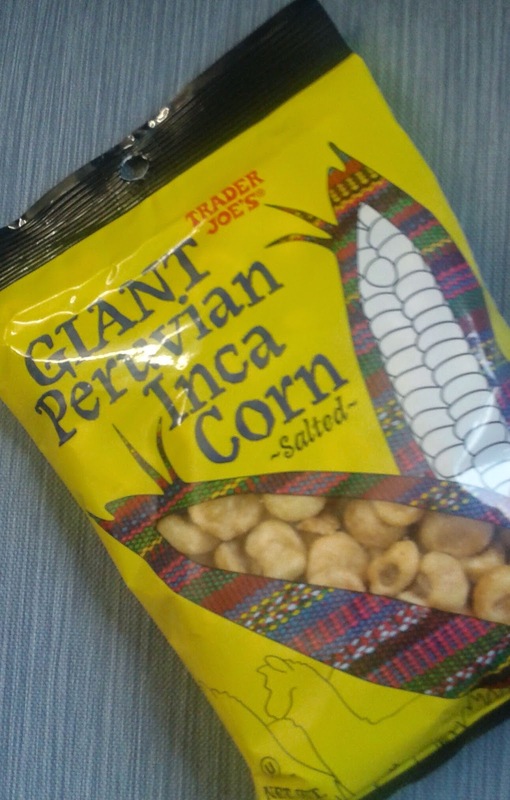 These Trader Joe's Giant Peruvian Inca Corn kernels are a lot like those, with an oddball American junkfood twist. Yes, I'm speaking of Corn Nuts, which I'll admit I'm not all that familiar with. And at first blush, these corney kernels taste much like a convenience classic I'm well acquainted with - namely, Fritos. I mean, it's corn, palm oil, and salt, so that can't be too surprising. After a couple crispy chomps, though, as the salt dissolves, the taste transforms to something a little more a-maize-ing...okay, not exactly "amazing" but definitely cornier. It's kinda like a Frito mixed with a super puffy popcorn widow. Not a bad snack, but kinda mundane after a while. I'll admit, it's not like I expected more flavor from them, but wanted it anyways, if only for remembering how good the chow in Peru was. I'm a little disappointed, but not overly. Sandy, though? She loved these, and there's a perfectly good reason why. Notice the background of these pics, that bluish vinylish material that looks like a really uncomfortable hospital recliner? Well, that's exactly what it is! We have just welcomed our second daughter, Baby B, into the world in the past week or so, so I spent a lot of time in that chair, and these corny poofs made a pretty nice little snack on repeated occasion. Both Mama and Baby are doing wonderful, thank you. Snack and junk food after having a baby has gotta taste awesome, right? Although, Sandy even thought the severely oversteamed hospital broccoli tasted wonderful, so take her opinion as you will. Anyways, I'd imagine we'll be picking these eternal kernels up again, if only mainly for her. Whatever she wants right now, she's got it. Sandy liked them well enough to give them a four, and while I'm not overly enamored with them, at least these are tied to some pretty nice little memories. which section of the store did you find these? thank you for all the awesome reviews! I was trying to figure out why these tasted so familiar- you pinned it down. They taste just like fritos but I like the texture better and I'd like to think they're a little healthier and less chemical laden. They actually serve these corn things in Peru as a sorta snack while waiting for your meal. I lived in Cusco for 6 weeks and saw them there. To the maker of Giant Peruvian Inca Corn, please can you make a Version of the Giant Peruvian Inca Corn with less or no salt. I love it so much it’s a great snack for , The problem is I have High blood pressure and it’s way too salty for me. So can you please consider people like me who loved and enjoy it can eat it without having to think that it will raise our blood pressure.